Precision engineered for your vehicle! WeatherTech No-Drill Mud Flaps use a patent pending QuickTurn stainless steel fastening system to attach to your vehicle. No drilling or tools are required. Each set of mud flaps is engineered to fit a specific vehicle like a glove. Durable materials and a precise fit make the WeatherTech No-Drill Mud Flaps your best choice for vehicle protection. Mud flaps work by deflecting dirt and debris away from the paint. Otherwise, the tires would fling mud all over your perfectly detailed side panels! If you drive off-road, on dirt roads, or muddy back roads, you’ve probably seen the damage done by flying rocks and mud. WeatherTech No-Drill Mud Flaps shield your vehicle’s paint to keep it clean and free of chips. Once you decide to get mud flaps, there’s simply no better choice than WeatherTech No-Drill Mud Flaps. DigitalFit technology molds each set of mud flaps to a specific vehicle application. Forget about one-size fits all, flimsy flaps. 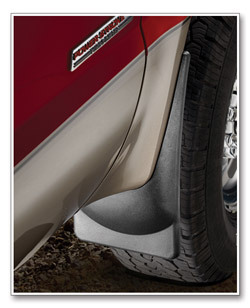 WeatherTech No-Drill Mud Flaps look like they belong on your vehicle because they are made for your vehicle. WeatherTech No-Drill Mud Flaps are made of an OE approved thermoplastic resin. This durable plastic material withstands the elements and provides exceptional protection for your vehicle. The hardened resin deflects rocks, dirt, and mud away from the vehicle’s side panels better than flexible rubber mud flaps. WeatherTech No-Drill Mud Flaps mount in minutes! WeatherTech’s patent pending QuickTurn fastening system uses hardened stainless steel to secure the flaps to your vehicle. Because there’s no drilling required, there’s no risk of rusting out a steel fender. The stainless steel fastening system ensures a secure, rust-proof connection. Each set of mud flaps is made to fit each vehicle. Therefore the flaps will have a clean, precise fit. To order, enter your vehicle’s year, model and part number in the designated box below. Set includes front and rear mud flaps.